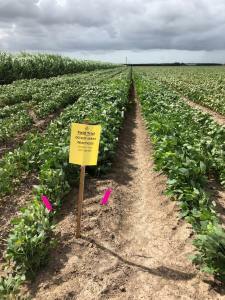 Imtrade Australia field agronomist for Queensland and New South Wales (Chris Poletto) has been busy in Bundaberg during February working in soybeans. Soybeans are an important rotation crop in many of the cane growing districts of both Queensland and New South Wales. Soybeans being a legume are a great break crop for planting in historically sugarcane monoculture paddocks. This is due to their flexibility, sustainability benefits and potential to generate additional income and/or for soil improvement. Due to the large volume of plant biomass (shoots and roots), and root symbiotic nitrogen fixing bacteria that colonise on the roots of soybeans, up to 300 kg/ha worth of nitrogen (N) can be incorporated back into the paddock after a soybean crop. This nitrogen bonanza is often used to supplement the nutrient requirements of subsequent planting of cane crops. This nutrient carry over benefits the farmer through a reduced fertiliser application rate, as well as the addition of a huge payload of organic matter being ploughed back into the soil profile which otherwise would rarely happen in cane cropping monoculture. Unfortunately however, soybeans like just about every other crop is prone to insect attack and at key stages can pose a very significant threat to the final grain yield if left unchecked. For example the major lepidopteran pests in soybeans, Cotton Bollworm and Native Budworm (2 species of helicoverpa) can inflict irreversible damage to the growing points of the plant and will often chew out the reproductive buds that would normally lead to flowers, pods and grain. 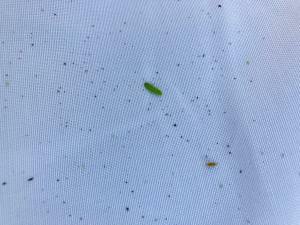 As a general rule one helicoverpa larvae detection per m2 of crop is able to inflict enough damage to reduce final yield by 40 kg/ha and depending on the value of the grain, chemical control is often warranted when thresholds of only 2 larvae/m2 are detected. Loopers are another common lepidopteran pest in soybeans, however thresholds for these are much higher due to being mainly leaf eaters. 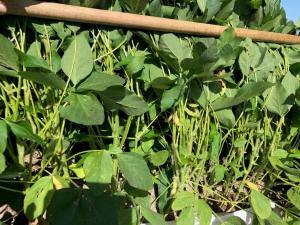 Soybeans are very resilient at maintaining their potential yield, even with up to 30% leaf loss/damage. Imtrade Australia is working on a Group 22A selective insecticide formulation and registration that can be added to the soybean grower’s toolbox. The new registration will be aimed at controlling the common lepidopteran and mirid pests that cause significant damage to soybean crops. Currently, field trials are going well with results showing very good control being obtained, whilst minimising any impact to the beneficial insects that are present. Imtrade Australia is a growing presence in the Ag Chem supply field with a range of pre and post emergent herbicides and insecticides already registered for the soybean industry as well as a couple of APVMA permitted options. As Imtrade Australia continues its strong commitment to the crop protection industry, through increased investment into research and development to deliver more quality economical crop protection products giving more options for growers to use in their pesticide toolbox. Chris would like to thank Tony and Mitchell Chapman for assisting Imtrade with a soybean trial site location this season.